Earn up to 8,145 reward points. Limited edition, low-wattage pint-sized powerhouse amp. The PRS 2 Channel Custom amplifier platform has received great accolades since its introduction in 2011. From time to time, however, PRS has been asked for something just a little smaller. Keeping all the versatility of the 2 Channel Custom 50, this 20-watt version limited edition amp is easier to transport and use in smaller clubs, rehearsal spaces, and the living room. 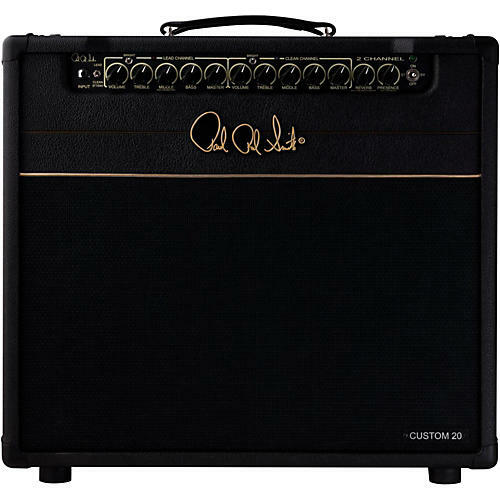 But, it is not only the lighter weight and the smaller box that defines this amp. For some, wattage equals tone and sometimes that tone is all about lower wattage tube amps. With lower wattage, you can crank up the amp and it saturates and breaks up earlier, delivering a tone that cannot be found in larger-platform amps. This is where the PRS 2 CH Custom 20 shines. Using two 5881 power tubes coupled with a Heyboer output transformer to crank out a muscular 20 watts, this amp strides from spanking clean tones to slightly overdriven rhythm tones on the clean channel, then sprints from crunchy to blistering overdrives on the lead channel without breaking a sweat. Outfitted with the channel boost, reverb and effects loop found on all of the 2 Channel Custom amps and packed into a comfortable-sized cabinet equipped with a trusted Celestion G12H-30, the PRS 2 CH Custom 20 is the perfect sidekick for the player looking for a solid, well-rounded, not-kidding-around amplifier that is easy to transport and delivers the sonic goods. Only 20 of these amps will be made for this limited run. Don't miss out on this delicious Paul Reed Smith tone. Order today before they are all gone. Dimensions: 26" x 13.5" x 25"